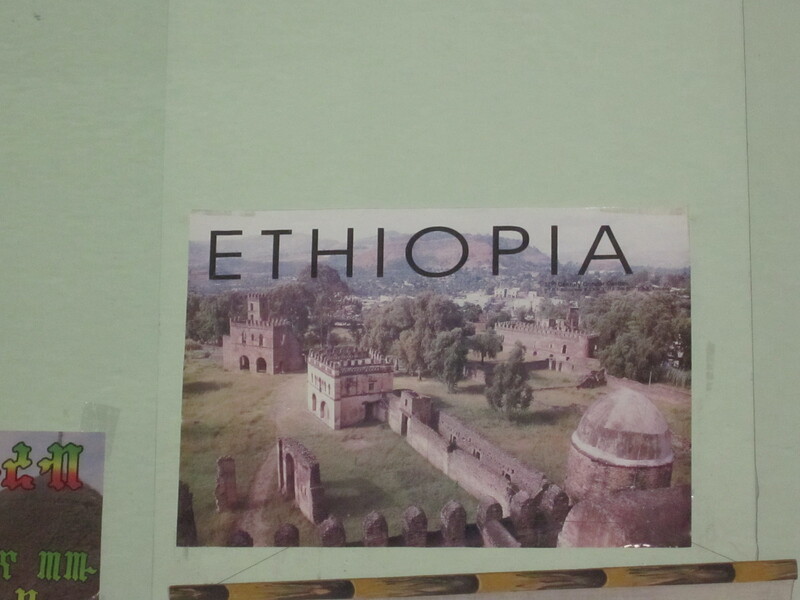 “In all our time as a group, how have we missed eating at an Ethiopian place?” I asked Gerry, who was with me at an Ethiopian place in Harlem called Abyssinia. “Too expensive usually,” Gerry responded, referring to our group’s tight $20 per person budget. 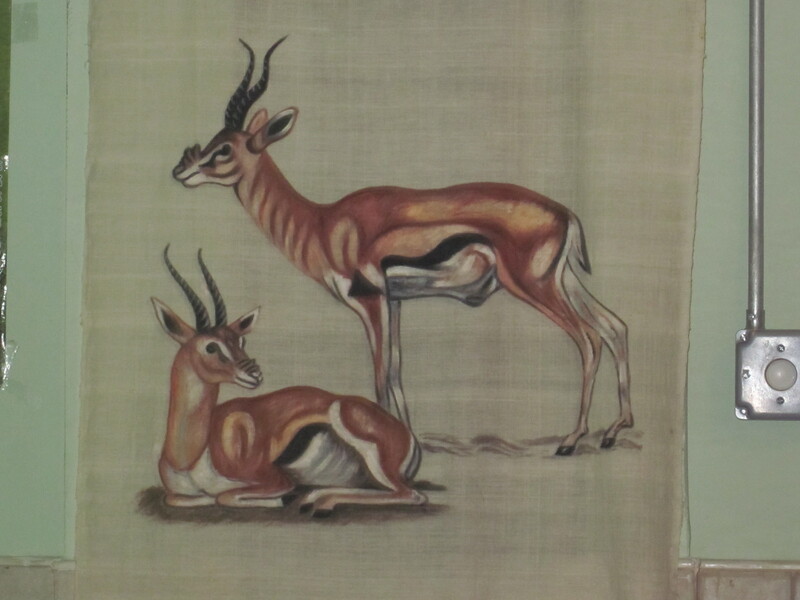 I looked at Abyssinia’s menu. Nothing was over $16. “Not here,” I said. “No, definitely not here,” Gerry concurred. It was a day after a nor’easter left a few inches of wet snow on the already soggy city streets and a little over a week after the big storm. Our group was scheduled to meet the previous day, but we were currently on hurricane hiatus. Though the group could not gather, Gerry decided to leave his still heatless Westchester home where he claimed there were no lines for gas, to drive into the city for what he hoped would be much needed spicy food. His hopes were quickly realized. Not only was the small restaurant deliciously fragrant, it had heat—lots of it. And adding to the warmth from the clanking radiators was the heat from the meat “sambusas” brought to us by our pleasantly quiet waiter. 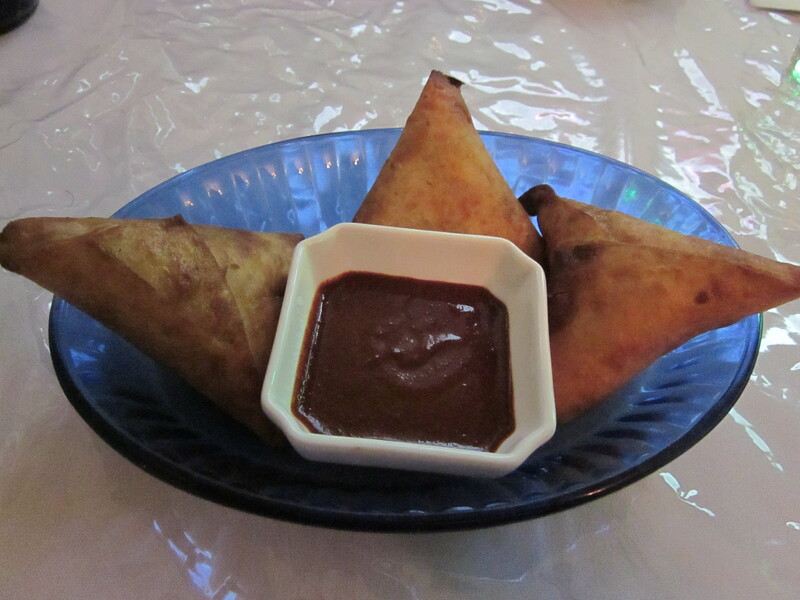 Similar to the Indian “samosa,” the sambusa was fiery and though berbere sauce, Ethiopian hot sauce, accompanied it, the added spice was not needed. Sambusas with Ethiopian hot sauce. To get a good sampling of the meats, we ordered the “meat combo,” featuring three meat options along with a separate order of yebeg awaze tibs, cubes of lamb sautéed with onions and jalapeno in an awaze (berbere) sauce. The meats came assembled on a colorful platter with each individual meat dish in a small mound along with a few vegetable sides and layered on top of the spongy Ethiopian bread known as injera. 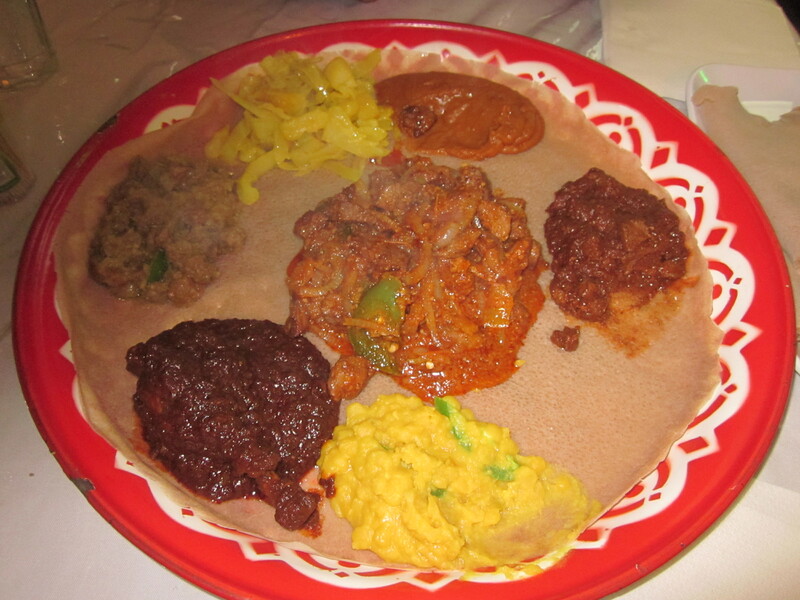 The Abyssinia meat combo platter. Along with the platter, we were given an additional plate of injera. There were no forks, spoons or knives on the table. With bread like this, who needed utensils? We scooped up the meat and veggies with the accompanying injera and shoved it into our mouths, doing our best not to let anything fall our already food-stained clothes. 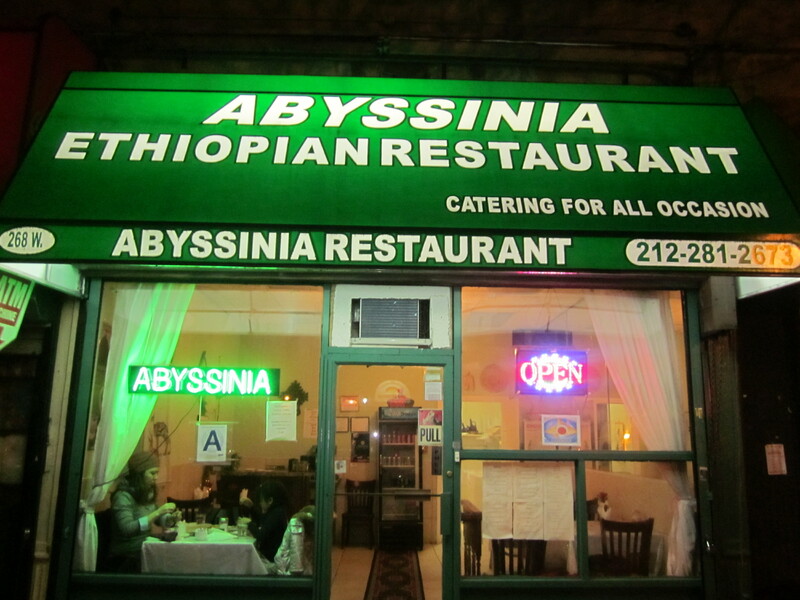 These meats were not on the day’s menu at Abyssinia. The doro wat, a chicken leg in a rich berbere sauce was tender, falling off the bone, the sauce identical to what coated the beef in the ye siga wat. The lamb, though not as tender as the beef or chicken, was aromatically addictive. Soon our “utensils” were gone and our waiter returned with another fresh plate of the injera for us. We went through that plate as well and still much of the meat remained. We were not ones to waste anything, but we just could not continue. 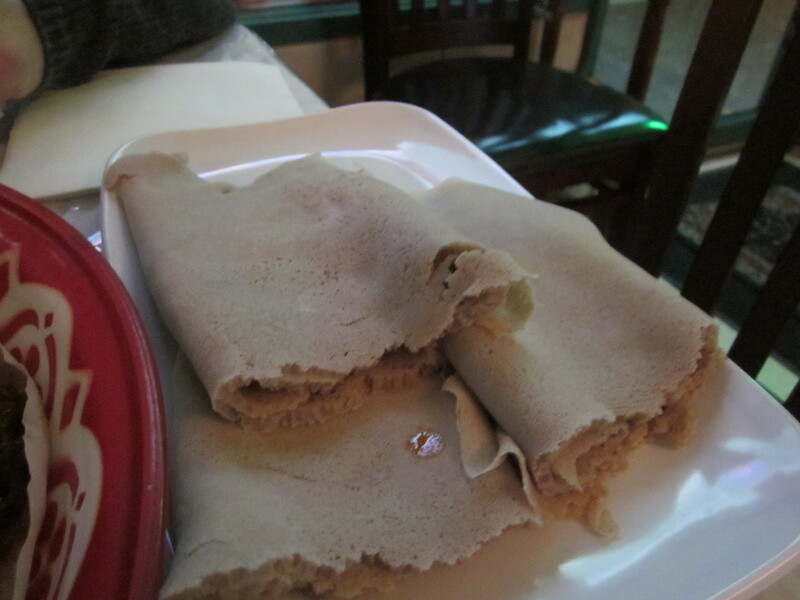 It was as if the injera had expanded in our gullets. The waiter came to our table. He smiled slyly and examined what was left and then shook his head. “This is the best part,” he said, indicating the injera that the meats were layered and now saturated with their juices. What was left did look delicious, but regrettably, any attempt to taste it might have resulted in a not very pleasant finale to what had been a much needed most comforting, post-hurricane meal. As he took away the platter, I stared at it longingly. We both knew we erred, but if you do not learn from your mistakes, you are destined to repeat them…or something like that. It would not happen again.